Jim Thompson fan here. 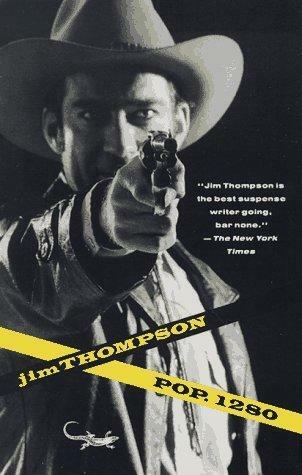 If you like Jim Thompson, I suggest you check out his book “The Criminal.” It’s up there with his best, but for some reason it’s never mentioned alongside them. I recently read it, not expecting much, and was blown away by how good it was. The Grifters is lined up next, but I certainly will get a copy of The Criminal. Thanks for the tip. Great review, you give a great taste of the book. I thought it was funny sometimes too. Thanks Emma. Glad you liked it. I was surprised to find one I liked more than The Killer Inside Me. Judging from the title this was the one that interested me the least and I’m really suprised you liked it this much or that it proved to be this good. Is it the funniest of the novels you read so far? It sounds as if, darkly funny, of course. Caroline: I agree that the title wasn’t that appealing to me too, but now I realise that there’s a underlying slyness to the title. Pottsville starts with a population of 1280 but there are considerably less inhabitants by the time the story ends. Yes it is very very funny, I laughed out loud. Not sure I’d rate it above Killer, but a tie, certainly! I also really liked this one: it wasn’t what I was expecting at all. It is very funny, in a sick dark kind of a way. The ending puts it on a different plane again, I thought…it disturbed me more then the shennanigans, duplicity, corruption and violence that trail in Nick’s wake up to that point. You’re right. The endings (at least of the ones I’ve read) take us to new territory. I get the sense that Thompson intended to disturb his readers. I think the skill is in giving us the sense we really know Nick – we’ve even been through the discovery of him “not being as dumb as he seems” so we think we’ve some kind of fix on him – peeled away the layers – then all “that” happens. The rug is pulled from under you. I wonder did Thompson mean him to seem crazy or….something else? Pop 1280 unloaded Thompson’s bitterest slam against his father, pumping Pop’s extravagant appetite to loutish gargantuanism, his politician’s bonhomie to addled servility, and his bully’s bluster to apocalyptic vengeance. Have enjoyed your and Emma’s dual reviews on this, Guy, esp. since I have the same version of the book illustrated in your post waiting for me here at home. Interesting to hear the comparison between those two Thompson protagonists, too. It’s been a while since I read the guy, but I saw the film version of The Killer Inside Me last year and thought it was OK in parts. Want to read more of that biography on him, too. I must say, though, the cops seem pretty dumb, or plain lazy. Truth is stranger than fiction, right? The killing you mentioned in the blog had that sort of feel to it–I thought it had to have been motivated by that sort of thing.